NEWPORT NEWS, Va., May. 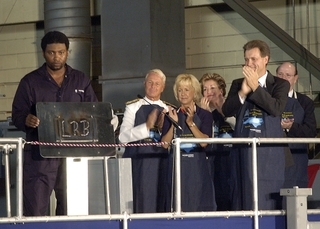 22, 2004 (PRIMEZONE) -- Northrop Grumman Corporation (NYSE:NOC) hosted a keel laying ceremony today for the Virginia-class submarine North Carolina (SSN 777) at its Newport News sector. U.S. Sen. Elizabeth Dole of North Carolina served as the keynote speaker for the ceremony. "I look forward to the day this North Carolina name-sake sets out on its course to protect our country," said Sen. Dole. "To all of you who are a part of the massive effort to finish its construction, thank you for your commitment to the United States of America and our Armed Forces." Mrs. Linda Bowman is the ship's sponsor and served as keel authenticator for the ceremony. Mrs. Bowman authenticated the keel by chalking her initials onto a metal plate. Her initials were then welded onto the plate, which will be permanently affixed to the submarine. The keel unit that was authenticated was the North Carolina's auxiliary machine room. Mrs. Bowman is the wife of U.S. Navy Admiral and Director of Naval Reactors Frank "Skip" Bowman. "I am so excited to be able to touch a piece of this ship and know that my heart, not just my initials, will forever be a part of USS North Carolina," said Mrs. Bowman. Named for one of the original 13 colonies, North Carolina is the fourth ship of the Virginia class. It will be christened in 2006, and upon delivery to the Navy in 2007, will be the most modern and sophisticated attack submarine in the world, providing undersea supremacy well into the 21st century. Northrop Grumman Newport News is teamed with General Dynamics Electric Boat to build the first 10 ships of the Virginia class. Other ceremony participants included Northrop Grumman Newport News President Tom Schievelbein, Assistant Secretary of the Navy Hansford T. Johnson, Congressman Bobby Scott, who represents Virginia's third district, Adm. Bowman, and Electric Boat President John Casey. Invited guests included Newport News and Electric Boat employees who are building North Carolina, U.S. Navy personnel, and government officials. For more information on the North Carolina (SSN 777), please visit www.nn.northropgrumman.com/northcarolina/. LEARN MORE ABOUT US: Northrop Grumman news releases, product information, photos and video clips are available on the Internet at: http://www.northropgrumman.com. Information specific to the Newport News sector is available at: www.nn.northropgrumman.com/index.html.